History has been made by the Midlands State University Faculty of Law moot team, which participated at the 9th Nelson Mandela World Human Rights Moot Court Competition held at the United Nations-Palais des Nations in Geneva, Switzerland from 18 to 21 July 2017. 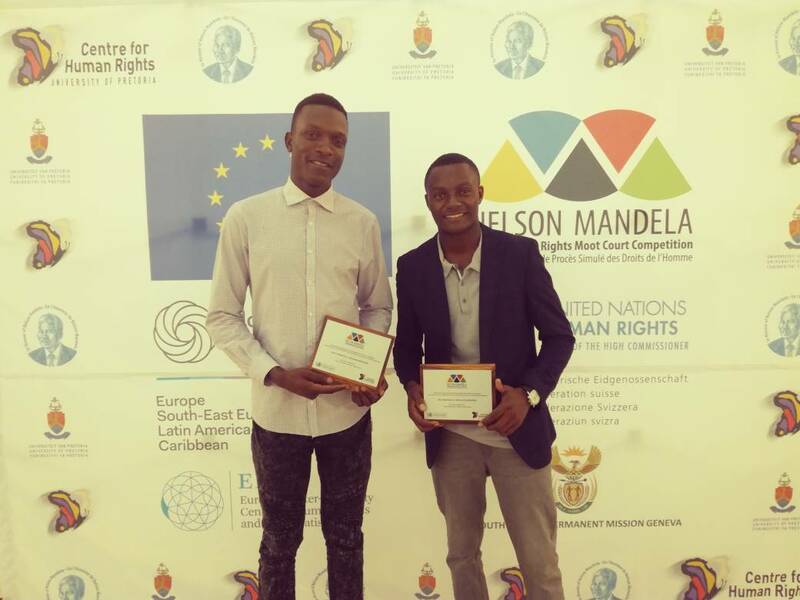 The MSU team of Brian Tatenda Madziba (a final year student) and Conrad Melusi Clinton Nyathi (a fourth year student) became the first-ever Zimbabwean law school team to come first in the HEADS OF ARGUMENT CATEGORY. Competing against some of the best law schools globally, that included Oxford University and Yale Law School from the United States of America, the Midlands State University moot team finished with an average score of 89%, which was far ahead of some of the planet’s best law schools to finish as number one in the category. This means for the 2017 edition of the competition; Midlands State University are the world champions in this category! This is a great achievement which no law school in Zimbabwe has ever achieved at the global arena. The Nelson Mandela World Human Rights Moot Court Competition is an annual event presented by the Centre for Human Rights, based at the University of Pretoria, with the support of the United Nations Office of the High Commissioner for Human Rights in Geneva, in collaboration with the Regional Office for Southern Africa of the United Nations High Commissioner for Human Rights (ROSA). The Competition is open to both undergraduate and master’s degree law students. The best 5 teams from each UN region are then invited to participate in the final rounds of the Competition in Geneva. From a total of 30 Universities that registered in the Africa Group, Midlands State University qualified among the top 5 teams to make it to the final round. In the final rounds, teams have to argue the two sides of the hypothetical case, the Applicant and the Respondent, before a ‘bench’ of human rights experts. The two best teams proceed to the final round, which is presided over by judges from international courts and tribunals. On behalf of the entire University community, we wish to congratulate the Midlands State University moot team for hoisting both the University and national flag high by adding yet another feather to the University cap.